[272 Pages Report]The global market for waste paper management has been growing proportionally with the increasing environmental concerns among people and enforcement of stringent environmental laws & regulations. The paper industry has been dominated by North America for more than a century now. North America is the largest producer as well as consumer of paper & paper products with a yearly per capita consumption of 487 pounds of paper. This region also enjoys significant availability of fiber resources, which enables it to hold the highest position in the global export of pulp & waste paper. The U.S. ranks first in pulp & paper manufacture and exports, globally, followed by Canada. The global waste paper management market is projected to be valued at around USD 43.35 Billion by 2020, and to grow at a CAGR of 2.55% from 2015 to 2020. The commercial sector as a source of waste paper is projected to grow at the highest CAGR from 2015 to 2020. This report provides a complete analysis of key companies and competitive analysis of developments recorded in the industry in the last five years. In this report, market drivers, restraints, opportunities, and challenges have been discussed in detail. Companies such as Veolia Environnement S.A. (France), International Paper Company (U.S.), Waste Management, Inc. (U.S.), UPM-Kymmene OYJ (Finland), and WestRock Company (U.S.), Republic Services Inc. (U.S.), Mondi Group (South Africa), Georgia-Pacific LLC (U.S.), Sappi Ltd. (South Africa), and DS Smith Plc. (U.K.) have been profiled to provide an insight into the competitive scenario of the waste paper management market. Mergers & acquisitions have been the key strategies adopted by leading companies to accommodate the rapidly changing technologies in application areas and to increase their market share. Companies have also adopted strategic investments & expansions and new product developments to bridge the existing gaps in their product offerings, end-market requirements, and geographical constraints. These strategies have been adopted by leading companies to ensure retention of the existing market share within the highly fragmented waste paper management market. 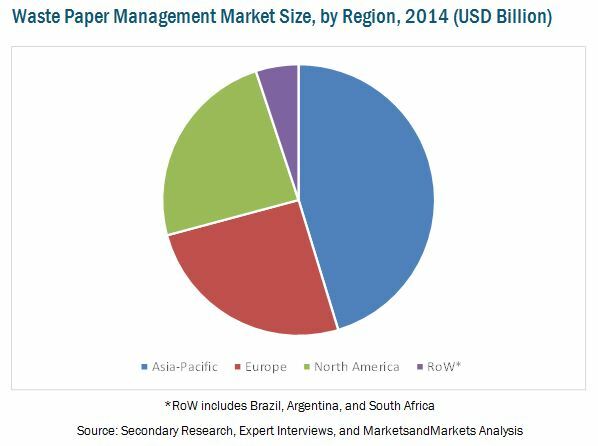 The waste paper management market is primarily driven by socio-economic factors such as public awareness and population trends. Laws and regulations enforced by governments is another major factor that compels paper & paper product manufacturers to manage and recycle waste papers. The key players of the waste paper management market prefer agreements, expansions & investments, and mergers & acquisitions to gain a larger share in the market. Leading waste management service providers are focusing on emerging countries that are estimated to show potential for industrial development in the near future. The demand for waste paper management services is projected to grow at a CAGR of 2.55%, in terms of value, from 2015 to 2020. The waste paper management market has been growing in accordance with changing consumer lifestyles and increasing urbanization. Factors such as growing population and increasing income levels of people have generated new opportunities for the waste management market after the economic downturn between 2008 and 2010. New technologies have been developed globally, which help in bringing down the amount of waste. The awareness about waste management has increased significantly with the progress in consumer education and increased awareness about health & environment. Concerns about the environment have compelled governments to impose stringent regulations to minimize the impact of waste and its harmful by-products on the environment. Strict laws have been enforced by governments for the management of waste paper to reduce the rate of deforestation globally. Regulatory bodies in the U.S. and European countries impose fines for non-compliance with standards and Acts. 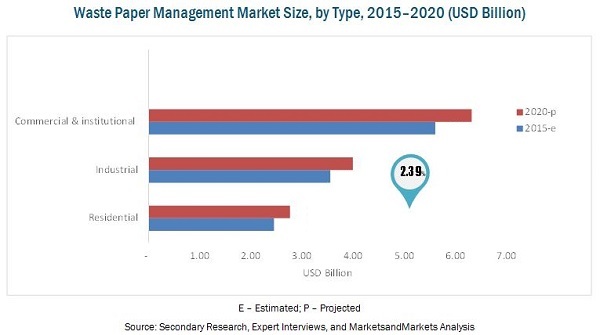 The waste paper management market is dominated by firms such as Veolia Environnement S.A. (France), International Paper Company (U.S.), Waste Management, Inc. (U.S.), UPM-Kymmene OYJ (Finland), and WestRock Company (U.S.). By gaining considerable expertise and experience over the years, they have optimized their processes and practices to become more efficient. The various waste paper generating sectors include commercial & institutional, industrial, residential, and others. The segmentation based on recovered products of waste paper recycling consists of container board, other paper & paperboard, newsprint, tissue, and pulp substitutes. The final segment, region, comprises the four main regions, namely, North America, Europe, Asia-Pacific, and Rest of the World (RoW). The commercial & institutional segment as a source of waste paper is projected to be the fastest-growing from 2015 to 2020. The key players in the waste paper management market prefer acquisitions and new product development to gain a larger share in the market. Leading waste management service providers are focusing on emerging countries that are estimated to show potential for industrial development in the near future. These strategies have aided companies to create a larger customer and partner base in key markets.